↑ 1.0 1.1 World Meteorological Organization, ed. (1975). Cumulonimbus, International Cloud Atlas (PDF). I. pp. 48–50. ISBN 92-63-10407-7. สืบค้นเมื่อ 28 November 2014. ↑ Haby, Jeff. 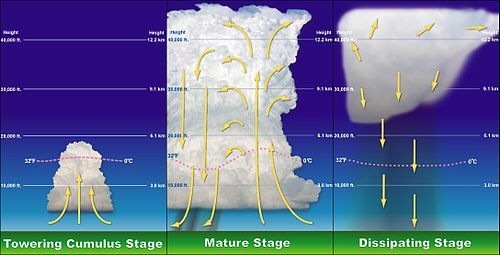 "Factors Influencing Thunderstorm Height". theweatherprediction.com. สืบค้นเมื่อ 17 June 2011. ↑ Michael H. Mogil (2007). Extreme Weather. New York: Black Dog & Leventhal Publisher. pp. 210–211. ISBN 978-1-57912-743-5. หน้านี้แก้ไขล่าสุดเมื่อวันที่ 19 พฤษภาคม 2558 เวลา 17:49 น.